Here is what is on my frame today. 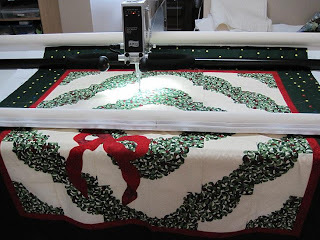 I am doing 6 of these quilts. This is only number 1. It is going to be a long week here at Thread Waggle. I have not decided if they will all be the same or if I will do something different on each one. I have been thinking about doing different background fills on each one. 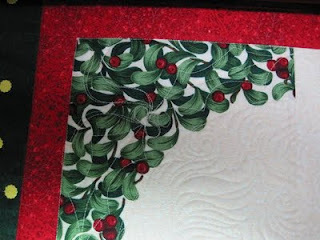 I am doing Holly leaves and ribbons in the green leaf areas. A swirly McTavish like back ground file. 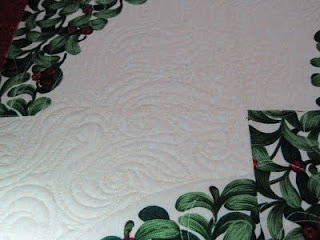 When I stablized the quilt I did arcs in the converse and concave areas so that it will have a lovers knot design on the back of the quilt. Now I just need to get going on the borders, then on to #2.